New press regulator IMPRESS has revealed that it is applying for official recognition under the Parliament-backed Royal Charter process. It is a move which paves the way for all publishers who aren’t members of IMPRESS to pay both sides costs in libel and privacy cases even if they win. Currently IMPRESS has yet to sign up any publishers as members. Under the Crime and Courts Act 2013 publishers who are not members of a Royal Charter-backed press regulator face the threat of exemplary damages in privacy and libel cases and punitive costs. Press Gazette understands that the exemplary damages clause kicks in on 3 November, which is the first anniversary of the establishment of the Government-backed press regulation Recognition Panel. This will have limited impact, as exemplary damages are extremely rare in libel and privacy cases. However, the new costs regime is expected to start once a new press regulator has been certified as compliant with the Royal Charter by the Recognition Panel. IMPRESS hopes to achieve this recognition by 3 November. This means that after this date, members of IMPRESS would only have to pay their own costs even if they lose libel and privacy court cases. IMPRESS will include a low-cost arbitration service designed to settle such claims out of court. The vast majority of UK newspaper and magazine publishers have signed up to industry-backed press regulator IPSO which does not comply with the Royal Charter on press regulation. Publishers see the Royal Charter process as step towards state control of press. The Guardian, Independent, Evening Standard and Financial Times are currently not members of any press regulation scheme. (b)it is just and equitable in all the circumstances of the case to make a different award of costs or make no award of costs. Funders of IMPRESS include the author JK Rowling, the Joseph Rowntree Trust and the Alexander Mosley Charitable Trust. 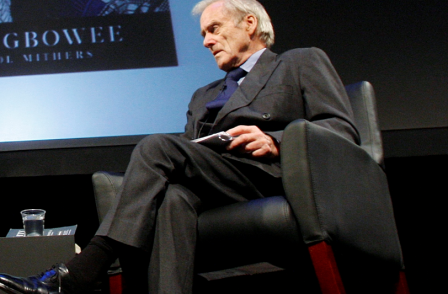 Former Times editor Sir Harold Evans (pictured above) is a patron of IMPRESS. He said: "I watched a series of scandals unfold in British journalism in recent years. Without a scrupulously independent system for effective monitoring and correction, we risk more abuses and another sharp decline in the public trust which is itself the foundation of a free press. The IMPRESS proposals promise to enable the best and discourage the worst." IMPRESS chair Walter Merricks CBE said: "IMPRESS aims to meet the demand from those news publishers who see the benefits in independent regulation, the protections it affords them and the assurance it gives to their readers. The regulatory structure set out in the Charter may not be widely loved, but it is the only one on offer that can deliver public confidence, and we will demonstrate that it can work." Asked what the key difference is between IMPRESS and IPSO, director Jonathan Heawood said: “The real difference is the level of accountability which this brings. IMPRESS will not solely accountable to publishers payings its bills. It will be accountable to independently-monitored standards. “It will offer an arbitration scheme to settle defamation and privacy claims. This is not a regulator which is a closed shop for people in the industry, it is much more open and public."